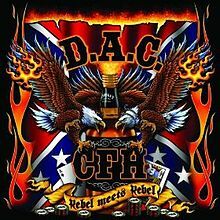 Rebel Meets Rebel is a country metal album by David Allan Coe and Pantera members Dimebag Darrell, Rex Brown, and Vinnie Paul. The music was written and recorded by the band when the musicians had time aside from their other projects, including Pantera’s world tour supporting Reinventing the Steel. The album was released on May 2, 2006, under Vinnie Paul’s own label Big Vin Records, posthumously after Dimebag Darrell’s murder in 2004. All lyrics written by David Allan Coe, all music composed by Dimebag Darrell & Vinnie Paul. At the close of the decade, Coe met Pantera guitarist Dimebag Darrell in Fort Worth, Texas, and the two musicians, struck by the similarity of the approaches between country and heavy metal, agreed to work together, and began production on the album, with Vinnie Paul and Rex Brown, which was recorded sporadically between 1999 and 2003, and released in 2006, two years after Dimebag Darrell’s murder. Originally the song Rebel Meets Rebel was supposed to be released as a duet with Coe and Phil Anselmo.